An overview of how France influenced the American War of Independence, intellectually, financially, and militarily, and how this resulted in America's eventual victory. This is a comprehensive look at how France influenced the American Revolutionary War in a variety of ways; intellectually, financially, and militarily. It raises the crucial question of whether America could have won its independence without the aid of France. The book begins with an overview of the intellectual and ideological contributions of the French Enlightenment thinkers, called the philosophes, to the American and French revolutions. It then moves to cover the many forms of aid provided by France to support America during the Revolutionary War. This ranged from the covert aid France supplied America before her official entry into the war, to the French outfitters and merchants who provided much-needed military supplies to the Americans. When the war began, the colonists thought the French would welcome an opportunity to retaliate and regain their country. France also provided naval assistance, particularly to the American privateers who harassed British shipping and contributed to the increased shipping rates which added to Great Britain's economic hardships. France's military involvement in the war was equally as important. 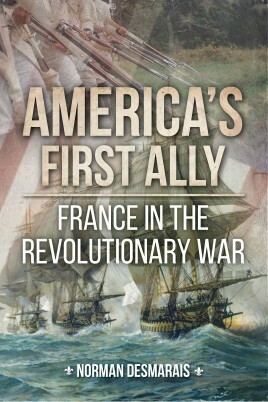 America's First Ally looks at the contributions of individual French officers and troops, arguing that America could not have won without them. Desmarais explores the international nature of a war which some people have called the first world war. When France and Spain entered the conflict, they fought the Crown forces in their respective areas of economic interest. In addition to the engagements in the Atlantic Ocean, along the American and European coasts and in the West Indies, there are accounts of action in India and the East Indies, South America and Africa. Also included are accounts drawn from ships' logs, court and auction records, newspapers, letters, diaries, journals, and pension applications. Norman Desmarais is Professor Emeritus at Providence College and an active reenactor. He is a member of Le Régiment Bourbonnais, the 2nd Rhode Island Regiment and the Brigade of the American Revolution. He is editor-in-chief of The Brigade Dispatch and the author of a number of titles on the Revolutionary War.